With those two words, eight dogs begin to run in unison, pulling our sled behind them. They are quite an assortment — black and white, some taller than the other, and all quite vocal. Up the hill they go, eager to keep going around each bend. As we pass through aspen forest, all I can hear is the huffing of their breath as they work to pull us ever higher into the Routt National Forest. Eager to pull, getting them going is a snap. Getting them to slow down or stop is a bit more difficult. “Easy, whoaaaa.” I put my two feet on the metal brake and hold the position as instructed by our coach, Emily, of Snow Buddy Dog Sled Tours. I find it even harder keeping the brake engaged and stopping the dogs from continuing. My shoulders ache from standing tall on the brake and clutching the handle. Still, I’m having the time of my life. “This so cool!” I say many times during our 3-hour journey. I became more interested in the sport of dog sledding after a visit to my aunt and uncle this past summer. My mother frequently told me of their numerous sled dogs they owned at their property near Cook, Minnesota. She’d even shared some photos with me — some all white, some looking more typical of a Siberian Husky — all sturdy looking. After years of contemplating a visit, we finally made the trip with our two “non-sled” dogs in August. The dogs live outside all the time, each with their own dog house and spot in the compound near the house. Like the dogs on our dog sled adventure, they frequently broke out in a cacophony of howling and barking any time of day. Because they don’t get to pull sleds all summer — it is too hot for them, many of them instead spend their time chewing up their wooden dog houses. One of them, Greek, has created a carport out of his by the time we arrive for our visit. During our visit, my uncle explained more about the art of dog sledding — finding the right dogs to lead, and building the right team with strength and stamina. I was surprised to learn that often mixed dogs can be just as good at dog sledding as the pure-bred Siberian Husky. Weight apparently can also vary, and it’s not always necessary to have the biggest dogs on your team. The final ingredient to success seems to be the dog’s ability to get along together. I could see how important it is to have the right mix of alphas and those who follow as well. That visit planted a seed, and I wanted to know more, as well as experience the sport up close and personal. So when researching a Christmas gift that both my husband and I could both enjoy together, I started looking on the internet. 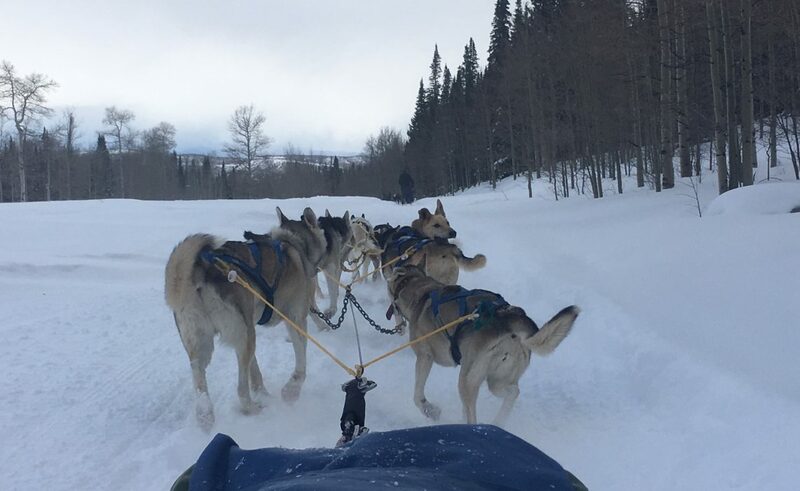 While several companies in Colorado offered a dog sled experience, Snow Buddy offered a chance for us to drive our own team for a half day adventure. Not only did we get to experience the thrill of driving a team through the snowy forest, we learned a lot more about the sport as a whole. Our adventure started with a talk with a staff member about safety, handling the dogs, and driving instructions including basic commands. Then we got to know our team, beginning with suiting them up with their special “x-back” harnesses. Think of webbing zig-zagging across the dog’s back with a small rope loop at the back. I felt a bit hesitant at first. Volunteering with dogs at the humane society, I’ve learned never to get too handsy with a strange dog. However, our team seemed friendly and eager to know us, even offering a paw to make it easier to put the harness on. The staff urged us to quickly hook up our dogs once the harnesses were on, to avoid chewing by some of the dogs. Once the dogs were all hooked up, Bryon was packaged like a burrito inside the sled. Blankets and, a weather-proof cordura with velcro kept him warm and dry from the elements. Our coach, Emily, urged me to get onto the sled. She impressed upon me the three T’s — tension, trot, and tight grip. Tension is important to keep the dogs from getting tangled. Trotting would keep us from flying over on the curves, and the grip would keep me the driver from falling off the back. With that, we began our journey. Right from the start, it felt exhilarating. The dogs were eager to go, and it wasn’t as difficult to stand on the runners as I first thought. I scanned the team, making sure the dogs’ lines didn’t become tangled. Though we were told to keep them at a trot, I kept wanting to urge them on to go faster and faster. After a break in a heated tent, complete with hot cocoa, many marshmallows, and yummy cookies, we head back. Bryon is now driving and I sit back and enjoy the ride, watching their legs move across the snow in quick succession. I’m having so much fun, I regret that our tour is coming to a close. It’s easy to see why my uncle became so hooked on this sport. The exhilarating feeling of speeding across the snow by dog power is intoxicating. Upon returning home, I look at Shawnee and Logan. I guess we’ll need to find six more sturdy companions to create our own dog team.